Although we know very little about upcoming drama Queen & Slim, what we do know is very promising. Centered around a couple whose night takes an unexpected turn when the police pull them over, this film could turn out to be a very relevant social criticism of the treatment of ethnic minorities by the police. Further hope for the film comes from Emmy winning writer and LGBT advocate Lena Waithe, known for her impressive television work including Master of None and the most recent iteration of Dear White People. Her debut film is set to star the sought-after Daniel Kaluuya alongside Jodie Turner-Smith (both of whom have made very successful role choices in the last 5 years) and is to be directed by first time feature length filmmaker Melina Matsoukas. Matsoukas won a Grammy for the direction of Beyonce’s iconic Formation video, so if that doesn’t suggest that this film will be a success, nothing will! With Bohemian Rhapsody a certified box-office success, it seems to be both coincidental and unsurprising that another biopic about a British music gay icon is on the horizon in 2019: Elton John. Judging from the teaser trailer, it could be what die-hard Freddie Mercury fans wanted from Bryan Singer’s film: a personal insight into the star himself whilst providing a celebration of his extraordinary musical career. With Taron Egerton as the Middlesex-born pop star, there is a credible British actor that seems to capture John’s persona and uncanny looks, alongside director Dexter Fletcher who recently half directed Bohemian Rhapsody and has a knack of making interesting ‘feel-good’ biopics about British icons. 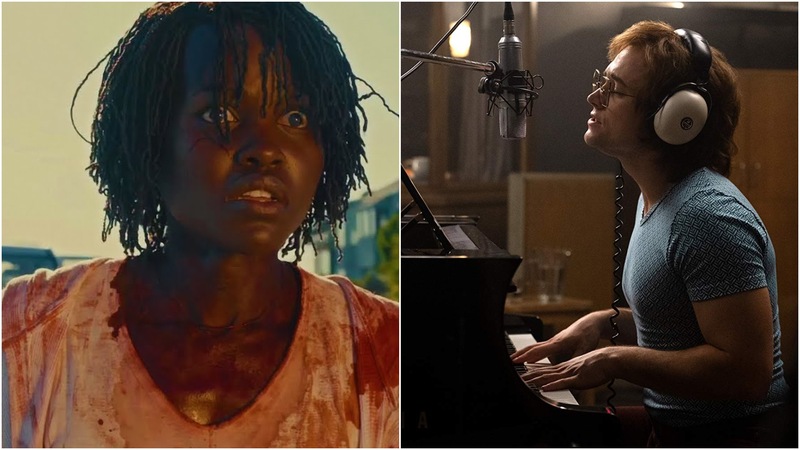 It also has the hit songs: the mashup between ‘Bennie and the Jets’ and ‘Rocketman’ seems certain to send goosebumps down the spine of any fan and the reconstruction of some of John’s live concerts could mean more potential quiet karaoke in the cinema. All of this might have the essence of deja vu but, unlike Bohemian Rhapsody, all the stars seem to be aligned without masses of controversy haunting behind the scenes. Scant detail is currently known about Jordan Peele’s sophomore directional effort Us, except that it will likely be a social horror in the same vein as his debut Get Out. The critical and commercial explosion of Get Out essentially earned Peele a golden ticket in the entertainment industry. Since its release, he has become attached to numerous projects, including a revival of classic TV anthology The Twilight Zone and a Candyman remake. There’s a possibility that Peele may become pigeonholed as the black horror director, yet, if Get Out is anything to go by, he has the wit and satirical edge – stemming from an extensive background in sketch comedy – to bring a fresh and provocative perspective to anything he touches. To make Us an even more exciting proposal, Peele has recruited Black Panther stars Lupita Nyong’o and Winston Duke to play his central duo. It’s going to be a must-see. Set for release in June 2019, an as of yet untitled project prepares to make a bold claim as the most British thing since afternoon tea and half-time pints. That project is Mancunian auteur Danny Boyle’s latest, a film which follows up the brilliant heroin induced nostalgia nightmare of T2: Trainspotting with a far more sugary brew. Providing the sugar is a writer you would imagine takes about seven; Richard Curtis will bring his UK utopia to Boyle’s oeuvre in their first, somewhat unlikely, collaboration. Even more British still is the supposed plot, Curtis’ screenplay is rumored to follow a musician who seems to be the only person in the world who remembers The Beatles. But, if you aren’t quite ready to cream your scones just yet, the cast is complete with an EastEnders ‘East Ender’, a beautiful British starlet on the rise and a familiar guitar donning red head. Himesh Patel, Lily James and Ed Sheeran may sound like the start of a very dodgy 5-a-side team but, if anyone can, Curtis and Boyle will get them playing. It may prove to be a little bit too milky and, yes, it is all but guaranteed to be too sweet, but take a sip and it might just turn out to be the cuppa you’re looking for.